I have been conducting my own investigation into e-gaming over the past year, and I am now convinced the RCMP erred in their finding. My research found sufficient reason to believe Robert Ghiz and Neil Stewart each committed a crime, and charges should therefore be laid against the former Premier and current Deputy Minister of Finance. This report systematically lays out the facts and arguments for this conclusion. I have attempted to make this report as concise as possible by providing numerous links to supporting documents and source material, rather than citing those documents even more extensively than I have. There were many improprieties; incidents of non-compliance with government policies and procedures; apparent conflicts of interest; and occasions where provincial laws were broken with the e-gaming initiative; as was confirmed by the PEI Auditor General’s (AG) special report on e-gaming. There may have been, therefore, other crimes committed by a number of other people involved with e-gaming, or possibly even other crimes by Robert Ghiz and Neil Stewart. However, this report deals solely with the issue of the destruction of e-gaming records ordered by Robert Ghiz and Neil Stewart, with an eye to determining whether those acts constituted a criminal offence. An interview with Sergeant Graeme Shaw with the Federal Investigations Unit of the RCMP. To find it reasonable to believe that a person known to have broken a particular law did so with criminal “intent” demands a very high bar. To accuse someone of a crime is not a trivial matter. Laws are broken for many reasons, and seldom constitute criminal offences. I have kept that in mind throughout the course of my investigation. Given both the seriousness and sensitivity of my finding, I have taken care to document (with links to source material) all essential and relevant facts for the arguments and claims I am making in this report. The “guide” and evaluative “criteria” upon which I relied to make what I believe is a reasonable determination that there was indeed the commission of similar but separate criminal offences by Robert Ghiz and Neil Stewart are adopted from a recent legal precedent, a remarkably similar case just adjudicated in Ontario. So, before getting into the details surrounding the destruction of e-gaming records by Robert Ghiz and Neil Stewart in PEI, I’ll first offer a summary overview of that case in Ontario, commonly referred to as the “gas plant” scandal. I believe that if the Ontario Provincial Police (OPP) had conducted the e-gaming investigation in PEI – using the same standards and criteria for assessing whether criminal charges should be laid as they relied on in their investigation of the gas-plant case in Ontario – they would have filed one criminal charge against Robert Ghiz, and one criminal charge against Neil Stewart. To be clear, I am not saying that either Robert Ghiz or Neil Stewart committed a crime. I am only saying that the information and uncontested facts available at this time warrant a criminal charge being laid against both men. Whether such a criminal charge would result in a guilty ruling for either Ghiz or Stewart is obviously a matter for the courts to decide. On January 19, 2018, former Ontario Premier Dalton McGuinty’s Chief of Staff, David Livingston, was found guilty of one count of Attempt to Commit Mischief to Data, contrary to s. 430(5)(a) of the Criminal Code, and one count of Unauthorized Use of a Computer, contrary to s. 342.1. of the Criminal Code, for destroying government documents related to the Ontario Liberal government’s decision to scrap two gas plants ahead of the 2011 election; a decision which allegedly cost Ontario taxpayers roughly $1.1 billion. That David Livingston authorized and arranged for the deletion of sensitive government records pertaining to the government’s decision to cancel the gas plants, in breach of a provincial statute, was never at issue. In that respect, the facts demonstrated that he was guilty of contravening provisions of the provincial Archives and Record-keeping Act. Prior to issuing the verdicts, Lipson said that the case turned on whether the Crown could prove beyond a reasonable doubt that Livingston and Miller ordered the computers wiped with the intent to delete data that they had an obligation to retain. (My emphasis). How was the deletion of data first discovered and then investigated by the OPP, leading to criminal charges? When 56,000 government documents related to the gas-plant issue were tabled with the Estimates Committee of the Ontario Legislature, committee members soon realized there were no documents from the Minister of Energy‘s office. A formal request for documents was issued by the committee; however, no documents were provided. The committee then issued an order to force compliance with the request for documents, to which the Ministry of Energy again refused to comply, citing issues of confidentiality and document sensitivity. Eventually, the Premier’s former Chief of Staff was called before the committee and informed members that no political staff records were available. [For detailed information concerning this entire matter see: Report of the Committee’s Request for Documents From the Ministry of Energy, August, 2012]. “While I cannot state with certainty that emails had been deleted improperly by the former Premier’s staff during the transition to the new Premier in an effort to avoid transparency and accountability, it strains credulity that no one knew that the practice of deleting all emails was not in compliance with applicable records management and retention policies.” [My emphasis]. The Information Commissioner’s report launched an OPP investigation just two days after it was tabled (April 14, 2013), which determined that it was McGuinty’s Chief of Staff, David Livingston, who had ordered the destruction of the gas-plant records in the Minister’s office, and criminal charges were filed against him. On April 11, 2018, Justice Timothy Lipson sentenced Livingston to 4 months in jail, 1 year probation and 100 hrs of community service. “This offence is very serious because it involves an attempt by the defendant to thwart the core values of accountability and transparency that are essential to the proper functioning of parliamentary democracy. Mr. Livingston’s plan was to deny the public its right to know about government decision-making with regard to the gas plant controversy.” (para. 49, p. 8). [My emphasis]. “Mr. Livingston attempted to frustrate the operation of the mechanisms of government accountability. A denunciatory sentence is required to reaffirm society’s legitimate expectation that those holding senior government positions conduct themselves with integrity and within the law. It was not for Mr. Livingston to unilaterally decide what the public should or should not know about the steps taken by government in its decision-making on the gas plant controversy.” (para. 57, p. 10). [My emphasis]. “We are not confident that we received all relevant government records related to e-gaming, the loyalty card program, and the establishment of a financial services platform” (AG E-gaming report, section 7.1, p. 44). NOTE: Although commonly referred to as the “e-gaming scandal or affair,” all references to “e-gaming records” in this report are meant to also include records relating to the loyalty card program, and the establishment of a financial services platform, given that these were essentially three aspects or phases of the same provincial government file. The AG did not provide the names of those senior government officials who had their email accounts deleted in her report [Special Assignment: Government Involvement with the E-gaming Initiative and Financial Services Platform], nor would government disclose those names – despite being asked at least eighteen (18) separate times by Opposition MLAs during Question Period in the Legislative Assembly. It was only when the AG appeared before the Public Accounts Committee (PAC) of the PEI Legislature looking into the e-gaming affair – following the release of the AG’s E-gaming Audit Report on October 4, 2016 – that it became known that the deleted email accounts and missing e-gaming records belonged to three senior government bureaucrats heavily involved in the e-gaming file: (1) Chris LeClair, (Ghiz’s Chief of Staff); (2) Melissa MacEachern, (former Deputy Minister of Tourism and Innovation); and (3) Rory Beck, (former Clerk of Executive Council). MacAdam clarified for the committee members that “six years is the retention period for semi-active records” in the Premier’s office [[Public Accounts Committee Transcript, February 15, 2017, p. 118]; however, given the importance of the e-gaming file, those records would – or should – have been classified as “active” records to this day, and most of them would certainly have been deemed “archivable” by the Provincial Archivist. 3. Did Robert Ghiz and Neil Stewart commit a crime when they ordered the destruction of e-gaming records? Both Robert Ghiz and Neil Stewart ordered the destruction of sensitive e-gaming records – including the email accounts of senior bureaucrats involved in e-gaming containing e-gaming records. As with David Livingston in Ontario, this was contrary to the provincial law requiring those records to be retained, specifically, s. 19.1(1) of the Archives and Records Act. The e-gaming record destruction orders issued by Robert Ghiz and Neil Stewart were certainly prime examples of both “non-compliance with legislation” (aka, “breaking the law”) and “decisions and actions” demonstrating a lack of due regard for transparency and accountability; however, it is also necessary to show that Ghiz and Stewart were aware of their moral and legal obligation not to destroy important and retainable e-gaming records to prove they acted with “intent” and therefore committed a crime. But again, making that determination is ultimately the function and responsibility of the legal system and courts; however, all that is required to justify laying a charge for the crime of an Attempt to Commit Mischief to Data contrary to S. 430(5)(a) of the Criminal Code is a finding that there is probable cause to believe that Ghiz and Stewart attempted to commit mischief to data. I believe the facts and arguments outlined in the following three sub-sections of this report offer sufficient cause to believe that Ghiz and Stewart attempted to commit mischief to data, and warrants laying a charge against each of them for the commission of this particular criminal code offence. “You are a Minister of the Crown. You are a representative of the people of Prince Edward Island. You have to be accountable to your constituents and to all people of Prince Edward Island. You need to make sure that you are following your own laws, your own rules and your own regulations. If you can’t do that, you should not be serving.” [Robert Ghiz, Guardian, May 24, 2007]. [My emphasis]. This particular news conference dealt specifically with Ghiz’s well-articulated platform regarding the essential importance of strict accountability and transparency regarding the fulfilling of government duties and responsibilities in accordance with all “laws, rules and regulations” in force. Just five (5) days after that news conference, Ghiz was elected Premier of PEI with a majority Liberal government. Although Ghiz clearly understood that he had a moral duty to abide by not only the established laws, but also the rules and regulations established in government, it is nonetheless conceivable that such rules and regulations may not have been in place when he assumed office as Premier; or perhaps there were ambiguous policies and procedures in place at that time regarding the retention and disposition of government records, especially regarding electronic files and email accounts. I have investigated this matter thoroughly and found that not to be the case. Record Information Management: Managing Electronic Mail which not only offered clear guidelines for all government bodies and employees regarding the procedures and protocols to be followed for the classification, storage and deletion of government records, but tied those guidelines explicitly to both Treasury Board’s Recorded Information Management (RIM) Directives [5.01 – Introduction; 5.02 – Policy Responsibilities; 5.03 – Core Program Elements] and statutory provisions in the Archives and Records Act. Section 6: “The Archives & Records Act stipulates that records of the provincial government cannot be destroyed or permanently removed from government custody without the development of records retention and disposition schedules or a one-time destruction order, approved in writing by the Public Records Committee.“ (p. 4). “In requiring that records not be destroyed without proper authority, the legislation recognizes that those who work and make decisions in the public interest must be accountable for their actions and decisions. The saving of records is an essential component of accountability.” (p. 5). “All information created by or supplied to government must be regarded as government records. As such, you are bound by the provisions of the Archives Act regarding disposal of information. No recorded information should be disposed of except in accordance with the procedures outlined in the Archives Act.” (p. 220) [My emphasis]. Given the existence of clear guidelines, policy documents, Treasury Board Directives and legislation, is it possible to explain the deletion of all e-gaming documents, including email accounts, from three of the key senior-level bureaucrats involved in e-gaming in such a way as to find probable cause that Robert Ghiz and Neil Stewart did not attempt to commit mischief to data? (1) No person shall, with the intent to deprive a public body, the Public Archives and Records Office or the Provincial Archivist of the custody, control or use of, or access to, a public record, (a) destroy or damage a public record; (b) erase or remove information from a public record or make a public record illegible; (c) remove or conceal a public record from the public body or the Provincial Archivist; or (d) direct, counsel or cause any person to do anything mentioned in clause (a), (b) or (c). (3) A person who contravenes subsection (1) is guilty of an offence and liable on summary conviction to a fine of not more than $10,000. The procedures that had been put in place – and were in place at the time Robert Ghiz and Neil Stewart ordered the destruction of e-gaming records – required the creation of detailed schedules (the “chain of command” for these procedures are outlined in detail later in this report). And we know from answers provided to the members of the Public Accounts Committee by the Auditor General that the email accounts containing e-gaming records belonging to Chris LeClair, Rory Beck and Melissa MacEachern were destroyed and permanently removed from government custody without retention and disposition schedules first being prepared and approved. Ms. Compton: Thank you. Lastly, and moving on to 7.7, records retention schedules, they’re enshrined in our law and they are a legal requirement. You found that the Department of Innovation and Advanced Learning, Innovation PEI and the Department of Tourism and Culture all failed to have schedules as required by law? Jane MacAdam: Yes, we did note these three entities did not have records retention and disposition schedules, complete schedules on file. [Public Accounts Committee Transcript, February 15, 2017, p. 118]. It is not surprising to learn that there were no schedules, given the fact that neither of the two individuals responsible for ordering the deletion of e-gaming records (Robert Ghiz & Neil Stewart) were authorized to order those records deleted, as per consistent provisions in the Archives and Record Act; Treasury Board Directives; and Record Information Management (RIM) policies. “It is imperative that one person in each department assume responsibility for all recorded information management functions within the department, regardless of type of system (centralized or decentralized) which exists. This person should be designated as the departmental Records Management Liaison Officer (RMLO).” [p.2]. [My emphasis]. If it was the case that “one person” was not in place – for whatever reason (e.g., insufficient resource allocation; a recent departure of the designated person without a replacement, thereby creating a ‘gap’ in administration within the record management system in that department, etc.) – one might argue such circumstances could possibly constitute a mitigating factor for Robert Ghiz and Neil Stewart to have taken it upon themselves to order the destruction of government records. That was, however, not the case. The AG gave Public Account Committee members the name of each of the Records Management Liaison Officers (RMLOs) for each of the three departments not providing any e-gaming records, and it was those RMLOs who were unable to provide e-gaming records to the Auditor General because they had been ordered destroyed by Ghiz and Stewart. “Okay, so it was Sally Ferguson in the Department of Finance, Leah Eldershaw in Economic Development and Tourism, Don Larter in Transportation, Infrastructure and Energy and Shannon Burke. She’s a senior records delegate in Economic Development and Tourism.” [Public Accounts Committee, February 15, 2017, P. 118]. Neil Stewart’s illegitimate issuance of an order to destroy e-gaming records supplanted the legitimate authority of the designated Records Management Liaison Officers in these three particular departments. I could not determine that the AG had also provided the name of the RMLO for the Premier’s office and Executive Council; however, the Record Information Management: Managing Electronic Mail lists the names of the Management Liaison Officers for each government department, and the name of the RMLO for Executive Council when Robert Ghiz became the Premier in 2007 was Rose Long. In other words, as was the case with Neil Stewart, Robert Ghiz clearly circumvented and supplanted the designated Record Management Liaison Officer’s authority within Executive Council when he ordered the destruction of the email accounts and e-gaming records of Rory Beck and Chris LeClair. The Premier is not a member of the Public Records Committee, so Robert Ghiz circumvented both the authority of the designated Records Management Liaison Officer for Executive Council and the Clerk of Executive Council when he ordered the deletion of the email accounts and other e-gaming records belonging to Rory Beck and Chris LeClair. (2) Subject to the terms and conditions under which records have been acquired or obtained, the Provincial Archivist may destroy or dispose of any record in the Public Archives and Records Office, where the Provincial Arl Archivist considers that it is no longer necessary to retain the record. 2001,c.28,s.6; 2017,c.60,s.5. Archives and Records Act. The main reason for carefully laying out the legal and administrative framework which is in place within the PEI provincial government – which I have just done here – is to show how several options were readily available to both Robert Ghiz and Neil Stewart to comply with the law. In light of a comprehensive overview of all the legislative, policy and administrative “checks and balances” in place at the time Robert Ghiz and Neil Stewart ordered e-gaming records destroyed, it becomes clear that a significant degree of premeditated planning was required for each of them to effect the destruction of those government records while at the same time circumventing the elaborate administrative and legal framework in place to prevent unauthorized destruction of government records, all of which gives rise to and establishes grounds to believe that those acts were carried out with mischievous intent. Opposition MLAs and media reporting on the e-gaming story have tended to focus on the deletion of the e-mail accounts containing e-gaming documents. An internet search generates a long list of articles highlighting this fact; articles such as: Emails deleted or disable? ; E-gaming emails deleted, text messages not provided to AG: Name names on deleted PEI e-gaming emails, Steven Myers says; etc. “We requested information and were not provided with any email or other records for these individuals. So, we got nothing. We got no hard copies, we got no emails, we got no electronic records, or any records whatsoever, from these three individuals.” [Public Accounts Committee, February 15, 2017, P. 137]. As already noted, when the AG appeared before the Public Accounts Committee, she provided the names of the three senior provincial government officials from which she obtained no e-gaming records: Chris LeClair; Rory Beck; and Melissa MacEachern. It is this last set of facts and circumstances which most clearly demonstrates reasonable grounds for the belief that the orders issued by Robert Ghiz and Neil Stewart to delete the email accounts and destroy all the e-gaming records for Rory Beck, Chris LeClair and Melissa MacEachern were given with sufficient ill-intent to justify laying a criminal charge of an Attempt to Commit Mischief to Data, contrary to s. 430(5)(a) of the Criminal Code. Pay close attention to the timeline in what follows. The available evidence also shows that the former Minister of Education – who is responsible for the Provincial Archives and Records Office – Hon. Doug Currie, and Premier Wade MacLauchlan, both mislead opposition MLAs and the general public concerning the deletion of email accounts and e-gaming records. “When an employee leaves the public service there’s a formal questioning. The IT Shared Services disable the email account. This is good business practice. Once an employee leaves there is no business need for them to access these accounts. At the same time it means the public is not mistakenly directing inquiries to former employees that would not receive a response. Even though the accounts are disabled, following the requests the records are backed up and stored for an additional year. Following that time the records are overwritten. This is a common practice that allows for space in the server and means the government is no longer paying license fees for unused accounts. As I stated, these actions follow a regular process as employees leave the system. Since 2007, when government implemented a system to track these actions, there have been 2,481 accounts disabled. This summer IT Shared Services updated its protocol so that [a] form requesting that account be disabled must include a signature stating that the employee’s records must first have been properly filed in accordance with the public archives and records act under my ministry. This will help ensure that all the email accounts have been disabled, that records have first been transferred or stored elsewhere.” [Hansard, December 1, 2016, P.1639] [My emphasis]. Minister Currie gave the very strong impression that prior to the summer of 2016 there was no procedure, policy or requirement in force to ensure that records in email accounts were, as he said, “….properly filed in accordance with the public archives and records act under my ministry.” Such was not the case. Treasury Board Directive 5.03 was in force when Robert Ghiz and Neil Stewart issued orders to delete email accounts containing e-gaming records and were, in fact, deleted before the e-gaming records in those accounts were properly classified and disposed as per the policy and laws in place (either by being “archived,” if classified as retainable records; or “deleted,” if classified as non-retainable) by the Provincial Archive and Record Office staff and the Provincial Archivist. “5. (e) Departments must complete a “Records Transfer Request” form (Attachment 5.03-III) available from the Public Archives and Records Office when arranging for the scheduled destruction of records directly from the office. This form must be signed by the departmental Records Management Liaison Officer.” [Treasury Board Directive 5.03: Record Information Management: Core Program Elements, p. 4]. Speaking with Rainnie, MacLauchlan said the Opposition will get names if they keep pushing: 2,500 of them. “What was called ‘deleted’ were in effect closed accounts, so that’s how many there are,” he said. “When an employee leaves government, normal practice is to have the email account removed. We were advised by ITSS that after a period of one year, an account that has been removed cannot be recovered. Consequently, if the employee does not manage his/her email records in accordance with policy, government records can easily be destroyed.” AG E-gaming Report, p. 41. However, the AG also confirmed to the PAC members that Robert Ghiz ordered Chris LeClair’s email account “deleted” (not the account disabled) on October 19, 2011, just eight (8) days after Alan Campbell replaced him as Ghiz’s Chief of Staff. And the AG also confirmed that Neil Stewart issued an order to have Melissa MacEachern’s email account “deleted” (not the email account disabled) on October 21, 2013, six (6) months after her last day of work for the PEI government on April 19, 2013. It appears that at no time did either Robert Ghiz or Neil Stewart contact or involve anyone from the Provincial Archives and Records Office. The AG indicated it was the Information Technology Shared Services (ITSS) staff who received the orders from Robert Ghiz and Neil Stewart to delete the accounts, although she also indicated she didn’t know the date when the account-deletion actually happened, only the dates when the “orders” were issued by Ghiz and Stewart for those accounts to be deleted. (See p. 131, February 15, 2017, Public Accounts Committee Meeting Transcript). The facts regarding Ghiz and Stewart issuing orders to delete the email accounts of these three key senior staff – without retaining any of the records – therefore contradicts what both the former Minister of Education, Doug Currie, and Premier MacLauchlan publicly stated in two ways: (1) with respect to how normal procedures were followed (e.g., all three accounts were deleted long before a year had transpired from the date of the employee’s departure from government – in fact, it was just a few days in the case of Chris LeClair), and (2) with the nature of the action taken on the email accounts (e.g., “disabling” or “deleting”) with the facts showing that the email accounts containing e-gaming records were ordered “deleted, not simply “disabled,” as both Currie and MacLauchlan had insisted. These facts relating to the timeline and administrative process culminating in missing e-gaming records clearly indicate that both Robert Ghiz and Neil Stewart made premeditated, focused decisions to interfere with the established procedures, laws and protocols regarding the retention and destruction of government records. They purposefully chose to contact ITSS staff, who had the technical skills to delete the email accounts, rather than anyone associated with the Provincial Archives and Records Office, or allow the designated Management Liaison Officers within their own departments to exercise her authority and responsibility for the records in the respective departments, as was required by the Archives and Records Act and RIM policies. What remains unknown, however, are the details surrounding the destruction of hard copy e-gaming records, or documents on computer hard drives, mainframes or “cloud storage”. The AG confirmed there were no records from these three key individuals, so those e-gaming records must have been deleted from their computer hard drives, mainframes, or cloud-storage systems. It is reasonable to assume that Ghiz and Stewart likely also ordered those hard copy and hard drive records destroyed. But why? The reasons for disposing, sorting, classifying and eventually deleting email accounts are obvious; some of which were mentioned by Doug Currie in the above December 1, 2016 citation from Hansard. But what would be the “benign” motivation to order the full-scale destruction of all e-gaming hard copy documents? The normal “out-of-sight out-of-mind” tendency is to forget about hard copy files in filing cabinets, once they are safely stored…not to seek them out and destroy them. Destruction of electronic documents on computer hard drives, mainframes or cloud-storage systems raises even more questions, given that it is both easy, convenient and inexpensive to store records electronically. And who did the destroying of hard copy and hard drive documents? Were hard copy documents shredded? If so, when were they shredded? Who deleted e-gaming files from hard drives, mainframes or cloud-storage systems? When? Has anyone even asked provincial government employees these questions? Many people believe there were reasons why senior government officials (and the Premier) would want e-gaming records destroyed, given the many irregularities associated with the entire failed e-gaming initiative. The Auditor General herself noted in her report that there were many irregularities, breaches of policies and procedures, and numerous occasions where laws were broken; and not only concerning the illegal destruction of government records, but also with the issuance of loans without legal authorization (monies which were eventually written-off as losses to the PEI taxpayers of approximately a million dollars). Again, it was later confirmed that the Chief of Staff she was alluding to in her report was Chris LeClair; and the former Deputy Minister was Melissa MacEachern. Another former Deputy Minister, Tracey Cutcliffe, secured various contracts through a consulting company within weeks of leaving her position with government. “Secrecy was the name of the game in the e-gaming scandal,” (Guardian, October 5, 2016). Based on all the facts outlined above, there is clearly probable cause to believe Robert Ghiz and Neil Stewart Attempted to Commit Mischief to Data, contrary to s. 430(5)(a) of the Criminal Code. For charges to have been laid, the RCMP would have had to have been provided all of the relevant information, as outlined above, showing probable cause for criminal intent. Unfortunately, neither the Auditor General nor the Attorney General initiated that investigation. Why not? 4. Why didn’t the Auditor General or Attorney General call for a criminal investigation of e-gaming ? Given what seems to be clear and convincing evidence of a “scorched earth” strategy to destroy all government e-gaming records with the key government staff involved in the e-gaming file, it remains puzzling why neither the Auditor General not the Attorney General of the PEI government asked the RCMP to conduct a criminal investigation into this matter. Chair: Okay. I guess I’m just curious: Why did you [Auditor General) choose not to use your powers under the Public Inquiries Act to find out what happened to these missing records? Jane MacAdam: As I indicate in the report – I think it’s in the introductory section – we gave it careful consideration, and based on the fact that there was a high probability that it could result in court proceedings. I mean, we consulted with our legal counsel as well in terms of the ramifications of using the powers under the Public Inquiries Act. It could have been costly. It could have dragged out for another year. Chair: I might remind you it was already costly to the taxpayers of PEI too, though, right? Chair: I guess my last question would be: did you alert any justice officials, the Information and Privacy Commissioner or the RCMP that government records were missing and presumably destroyed in violation of the law? Jane MacAdam: Would you read those names off again? Chair: The Information and Privacy Commissioner or the RCMP or any justice officials here on PEI. Jane MacAdam: Not the RCMP and not the privacy commissioner, but we did send a copy of our draft report to department of justice. Chair: You didn’t send up any red flags that records were destroyed and the law was broken? Jane MacAdam: The section of the report on records retention was shared with the Department of Justice. Chair: What was the Department of Justice’s response? At that time, the Minister of Justice was the Premier; and the Premier was also the Attorney General. Opposition members and members of the public had raised concerns about this state of affairs, suspecting this apparent conflict-of-interest on the part of the Premier (who is both the Liberal successor to a former Liberal Premier Robert Ghiz, and Ghiz’s close personal friend) explained his refusal to call for an investigation by the RCMP. When Premier MacLauchlan became aware that Robert Ghiz and Neil Stewart had illegally deleted sensitive government records, he refused to take any action to hold either of them accountable for breaching provincial statutory provisions of the Archives and Records Act , which, as noted above, unequivocally forbid the unauthorized deletion of public records and now calls for stiff penalties and consequences for employees guilty of committing such an offence (section 19.1 (3)(4) cited above). 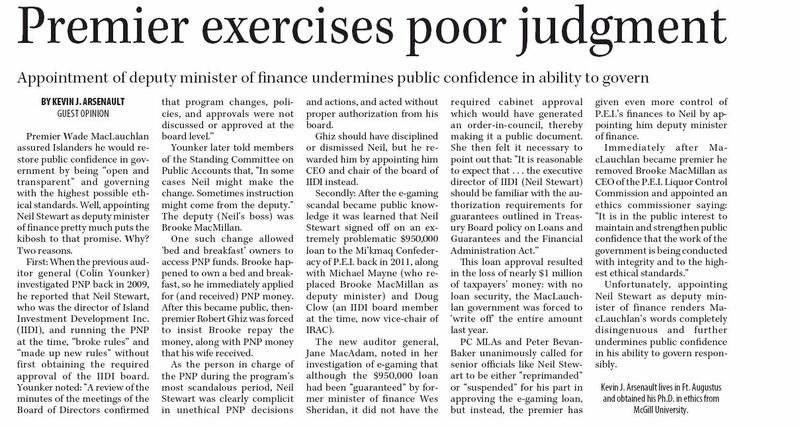 In fact, less than a year after these revelations became public, the Premier appointed Neil Stewart Deputy Minister of Finance. The illegal act of ordering the destruction of e-gaming records by Neil Stewart was not the only incident where Stewart “broke the law” with e-gaming: the AG also noted Stewart signed off on a loan of approximately a million dollars without proper authorization as required by the Financial Administration Act (AG E-gaming Report, p.23) and was just another example in a long history of non-compliance with government policies and laws by Stewart (See: “Premier Exercises Poor Judgment,” Guardian, October 26, 2017). The Premier has at no time shown any interest in commenting on what happened under Robert Ghiz related to e-gaming, so it is perhaps not surprising that he neither pressed charges for breach of provincial statutes nor asked the RCMP to undertake an investigation into the e-gaming affair to determine whether any crimes had been committed. The RCMP were likely aware that the Premier had no interest in going down that road when they were subsequently asked by then-leader of the NDP, Michael Redmond, to undertake a criminal investigation of e-gaming. It should also be pointed out that the Liberal government held a majority vote on the Public Accounts Committee, and used that majority vote to resolutely refuse to allow key individuals – such as senior bureaucrats or Liberal Ministers at the heart of e-gaming – to be called before the committee for questioning, despite both the Progressive Conservative and Green Party opposition members on the committee repeatedly making those requests. Those MLAs have, not surprisingly, accused the Premier of stifling the work of the committee. “My question is to the Premier: During the strategy planning with Liberal members and others on January 6th, 2017, Robert Vessey stated: the Premier wants e-gaming put behind him. Next, Spencer Campbell stated, and I quote: We are the government lawyers on this file. The Premier’s answer? : “No I was not”. On April 24, 2018, I spoke with Sergeant Graeme Shaw with the Federal Crimes Investigation Unit of the RCMP who headed-up the e-gaming criminal investigation initiated by former Leader of the PEI NDP, Michael Redmond. I identified myself as a freelance investigative writer, and told him I would soon be publishing the results of my own year-long investigation of e-gaming, and that I was focusing almost exclusively on the destruction of e-gaming records. Me: “So you’re conclusion was that they were deleted accidentally? My interview with Sergeant Shaw made me realize that in the course of their investigation, the RCMP failed to appreciate exactly how the retention and disposition of sensitive government records actually works within government. His statement: “you can’t keep everything all of the time,” sounded like a justification for the deletion of e-gaming records, which represents a mistaken assumption regarding record keeping within the provincial government. Such a lack of understanding would clearly have prevented the RCMP from making a proper assessment of whether probable cause exists to believe Ghiz and Stewart acted with criminal intent. When records are deemed “retainable” by the Provincial archivist, they are kept for perpetuity, and the e-gaming records (or certainly most of them) would have met the criteria for being assessed as “retainable” records by the Provincial Archivist. Again, and this can’t be overstated, the lack of knowledge by the RCMP investigator concerning the record management laws, procedures, policies and protocols within the provincial government would have made it impossible for them to render a fair and informed decision regarding whether it is reasonable to believe that Ghiz and Stewart committed the crime of Attempting to Commit Mischief to Data. The fact that they breached virtually every aspect of the established laws and policy to get rid of every e-gaming record – long before the mandatory one year retention had transpired – clearly represents a “scorched earth” strategy surpassing even that of David Livingston in the gas-plant scandal in Ontario. I believe this revelation alone constitutes sufficient grounds to trigger a new criminal investigation into this matter. However, I also believe this report provides sufficient facts, analysis and argument to warrant criminal charges being laid without any further investigation – a fuller disclosure of the facts will likely only happen in a court of law where the key players in the PEI e-gaming affair are compelled to offer sworn testimony under oath – something that has not yet happened. I find Sergeant Graeme Shaw’s distinction between “information” and “evidence” to be meaningless and confusing. The issue at the heart of the e-gaming records is not one of semantics, it is one of “intent,” as Sergeant Shaw correctly stated. To ascertain a probable case of criminal intent sufficient to warrant laying a criminal charge, it is first necessary to understand – in the most comprehensive way possible – all the attending circumstances that established the boundaries for action, the available information which the person who “acted” was privy to regarding laws, policy, procedures, work expectations, duties, limitations regarding the authority to act, etc. When the action under investigation is “the deletion of sensitive government records” and the investigator candidly admits that “…the provincial government have standard operating procedures and things that I’m not privy to, I don’t know how the government works,” then a finding that there was no evidence of any intent to commit a crime essentially represents an admission of ignorance of the relevant facts required to make a determination regarding intent. In other words, if there was in fact reasonable grounds to believe there was intent to commit a crime (which I believe is contained in this report) it would not have been identified as such by the RCMP, given the admitted ignorance about the very context and environment within which that possible crime would have taken place which would have precluded such identification. In conclusion, my review of the facts, especially as outlined above in sections 3.1, 3.2, and 3.3, offers sufficient reasons to believe that Robert Ghiz and Neil Stewart acted with mischief, or at least sufficient probable cause to warrant one criminal charge of mischief to data be filed against each of them. As with all allegations of legal wrongdoing, it remains the prerogative of a judge (or jury) to ultimately “test” that charge within the parameters of a criminal trial, where those accused are afforded an opportunity to put forth a defence to prove their innocence, while the Crown puts forward a case for the judge (or jury) to support the belief that the act was commissioned with an intention to commit the alleged crime. As I’ve already noted earlier in this report, many questions remain unanswered: questions such as those regarding the whole-sale deletion of all e-gaming records, including hard copy documents. Those questions will likely only be answered in a trial. If Robert Ghiz and Neil Stewart are innocent, evidence proving that will undoubtedly come out in a trial; if they are guilty, as David Livingston was found to be in the gas-plant case in Ontario, that too will likely come out in trial. A trial will finally provide answers to the many questions still being asked by Islanders regarding the costly, failed e-gaming initiative and remove the cloud of suspicion that presently hangs over the heads of both Neil Stewart and Robert Ghiz. As is well known, Capital Markets Technologies Inc. (CMT) is presently engaged in a civil litigation action seeking damages it alleges resulted from a breach of the terms of an MOU it had with the PEI government. The merits of CMT’s allegations have yet to be tested in court, although the judge recently ruled in favour of a Motion filed by CMT to add additional names to the case, largely based on revelations from the Auditor General’s report. There are now 16 named defendants in the action including Robert Ghiz, Neil Stewart, Chris LeClair, and Melissa MacEachern. The Plaintiff’s Responding Motion contains information based on documents submitted as evidence relating to the destruction of e-gaming records which is of interest and relevance to my report. I am not including this as part of my “argument” in support of the belief there is sufficient evidence to warrant a criminal charge being laid against both Robert Ghiz and Neil Stewart; however if the allegations outlined in this motion are eventually proven in court, it is easy to see how criminal intent may have fueled Ghiz’s and Stewart’s decisions to order the destruction of e-gaming records. 86. Spoliation or destruction of evidence is an act of commission conducted for a purpose. The rebuttable presumption of fact is that destroyed evidence would not assist the spoliator and therefore the evidence was destroyed. Inference: Ghiz ordered destruction of the LeClair’s emails to hide from public view the fact that LeClair after his forced resignation set out to destroy the Financial Services Platform and promote an alternative business service platform designed to enrich Ghiz, Sheridan and LeClair personally. proposed replacement for the Simplex Financial Services Platform, and attempted to hide from public view the names of Newcourt/Newco and Laslop by misusing of section 15. (1) of the Freedom of Information and Protection of Privacy Act. attempt to destroy other persons reputations with a series of false statements. Inference: Ghiz ordered destruction of the Beck’s emails to hide from public view the fact that Beck was involved in the E-gaming initiative (Sheridan initiative) from the very beginning as Clerk of the Executive Council and Secretary to the Cabinet. Inference: Ghiz ordered destruction of the Beck’s emails to hide from public view the fact that Beck favoured the Financial Services Platform and that Beck was involved in the Loyalty Card Program (MacEachern initiative) from the very beginning as Clerk of the Executive Council and Secretary to the Cabinet. individuals dealt directly with Newcourt/Newco and Laslop. promote the Loyalty Card Program. the MOU when these individuals dealt directly with Newcourt/Newco and Laslop. Maceachern in an attempt to protect the reputation of Ghiz. This entry was posted in Provincial Politics and tagged Archives and Records Act, CMT, Doug Currie, e-gaming, Graeme Shaw, Jane MacAdam, Neil Stewart, Provincial Government, Public Accounts Commitee, Robert Ghiz, Wade MacLauchlan. Bookmark the permalink. 9 Responses to DID ROBERT GHIZ AND NEIL STEWART COMMIT A CRIME? stinking piece of business by the ELECTED GOVERNMENT officials of P.E.I . To much of this slimy work being done here and no one being made answer for it . This was a long read but a fascinating one on so many levels. I believe your assessment and conclusions to be bullet-proof and paint a dismal picture of the corruption inherent in out political system. I worked for the Province back in the nineties when stricter guidelines were being developed and implemented in every Department due to the volume of information being created and shared. At that time specific employees were being hired in records management. The actions directed by these so-called Public Servants is an obvious circumvention of well established information policies and I am completely baffled by ITSS’s role of implementing these directives, knowing full well that it was a contravention of policy with potentially legal consequences. RCMP Officer Shaw’s responses to your questions demonstrates a level of ignorance to logical policy that fails to inspire confidence in his ability to exercise to any great degree, his investigative role. The public deserves better. An excellent piece of investigative journalism, Kevin! Good job! Is this report available for download? Thanks! I’m actually going to spend a couple of hours this afternoon reformatting it as a pdf file which will be available for download. I’ll put a link to the PDF at the top of this page when it’s ready. Two common things take place in the PEI justice system: judge-shopping and RCMP-shopping. People know what’s going on now and how the corrupt practices are conducted. Even the billionaire POTUS (PRESIDENT of the United States) is getting caught up in his own tangled web. Kevin thank you for your detailed investigation which shines some light on this dark time in our political history. I feel dismayed and concerned about the RCMP investigation or lack thereof into this matter. Thank you, Kevin. What an interesting read. Sergeant Shaw’s floundering explanation is unbelievable! Given your investigation, it is hard to come to any other conclusion than that there was a deliberate attempt to thwart justice.